26 items found searching fields on 2 pages. 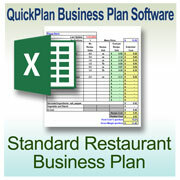 QuickPlan rapidly develops restaurant business plans you can take to the bank! Whether you are starting a fine-dining, full-service or fast-food restaurant, are looking for expansion capital to open your next restaurant or want to sell your multi-restaurant chain, with QuickPlan, all you have to do edit and fill in the details of an alre... more. QuickPlan Hotel rapidly develops business plans you can take to the bank. This is the only complete industry-specific business plan software available for the hotel business. Whether you are starting your first hotel, looking for expansion capital to open your next or want to sell your multi-unit chain, with QuickPlan, all you have to do... more. QuickPlan Ice Cream Parlor rapidly develops business plans you can take to the bank. This is the only complete industry-specific business plan software available for the ice cream parlor business. Whether you are starting your ice cream shop, looking for expansion capital to open your next or want to sell your multi-unit chain, with Quic... more. 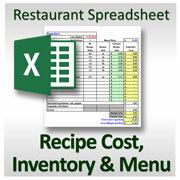 QuickPlan Pizza Restaurant Business Plan Software rapidly develops pizzeria business plans you can take to the bank! This pizza-specific member of the QuickPlan family is modeled after a one-hundred seat, full-service pizzeria. Whether you are starting your first restaurant, looking for expansion capital to open your next or want to sel... more. QuickPlan Resort rapidly develops business plans you can take to the bank. This is the only complete industry-specific business plan software available for the resort hotel business. Whether you are starting your first resort, looking for expansion capital to open your next or want to sell your multi-unit chain, with QuickPlan, all you h... more. QuickPlan Sandwich Shop is a comprehensive submarine / deli / gourmet sandwich shop business plan based on a unit of an extremely succesful and well-known sub shop chain (but it customizes easily to work with your special situation). With QuickPlan, all you have to do is edit and fill in the details of an already written and organized bu... more. QuickPlan Wine Bar is a comprehensive business plan based on a full-service one hundred seat wine bar cafe offering lunch and dinner (but it customizes easily to work with your special situation). With QuickPlan, all you have to do is edit and fill in the details of an already written and organized business plan. The hard part is alread... more.